Greater Flamingos are today numerous in the Mediterranean region, but there are only 8 localities where they regularly breed. The species is, therefore, vulnerable, particularly because many wetlands are threatened by drainage, tourism developments or other transformations. We still have much to learn about the biology of this flag-ship bird, particularly how flamingos exploit the different wetlands, how they decide where to breed, and how long they live. In order to improve our knowledge of the flamingo’s way of life, ornithologists at the Tour du Valat began banding chicks in 1977 with PVC bands, the code of which can be read in the field. Each year, about 800 chicks almost ready to fledge are captured and banded. 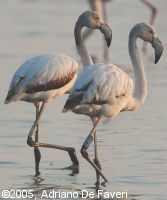 Spanish, Italian and Turkish ornithologists presently cooperate with the Tour du Valat in this Mediterranean-wide project and it is now possible to see flamingos banded as chicks in Andalusia, Catalonia, Italy, Sardinia and Turkey. To date, 53,000 chicks have been banded and there have been 615,000 resightings of these birds from all 23 Mediterranean and West African countries south to Guinea-Bissau. Observations of banded flamingos allow us to study movements in detail, to see at what age birds begin to breed, how frequently they nest, to measure breeding success and site fidelity. Some individuals have been seen more than 300 times in 30 years. Movement patterns differ greatly between individuals with some birds crossing the Mediterranean and others being largely sedentary. Those leaving the Camargue move either to the south-east, to Italy, Sardinia or Turkey, or they fly south-west down to the Iberian Peninsula, Morocco, Mauritania or Senegal. Smaller numbers of birds move east to Greece, Turkey, Cyprus, Egypt or Israel. 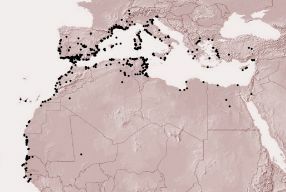 Unfortunately, not only are observers in the southern Mediterranean few and far between but they also can often not afford to purchase the optical equipment necessary to read band codes and consequently data are lacking from a large part of the flamingo’s range. Each time that ‘your’ flamingo(s) is(are) reported to the data base, you will be informed by email. Further, you can track your bird’s movements and life-history either on a interactive dynamic map or in a table. Since 2005, it is possible to support a flamingo born in either France, Italy or Catalonia. * The Tour du Valat is a registered charity. If you live in France and support a flamingo born in the Camargue, 66% of your contribution can be deducted from your revenue, as long as this does not exceed 20% of the income you declare. You will be sent a receipt at the beginning of the year.